So, we picked Bluebell up that afternoon, mad dashed it back home to get packed and then set off oop north! We were using my dads drive in Newark to break the journey up, and of course, to show off Bluebell. When we left Marquis we had a full tank of water and we ready to rock and roll. What we hadn’t anticipated was for that Friday to be “rather chilly” – it was so cold that our full tank of water FROZE on the journey to Newark. Whoops, that wasn’t the plan, obviously, and we were rather worried we’d knackered our water tank up in the process. As soon as we parked up, we got the heater on and crossed our fingers and toes and hoped for the best..
We set off bright and early for our first stop – Hutton Le Hole. We hadn’t anticipated the amount of snow we passed, especially during our journey up Sutton Bank, but hey ho, it sure looked pretty and Bluebell got us well and truly up those steep windy roads! We had a little stop on Sutton Bank for a walk (still no water by the way – despite trying to force boiling water that we got from the nice lady in the tourist centre on Sutton Bank down into the tank…) to watch the gliders taking off..
We arrived at our site for the night The Crown, Hutton Le Hole, and settled ourselves in. It was -10 degrees and our water was still well and truly frozen – a bit like the atmosphere that was brewing inside the van.. not the start we were hoping for! We kept the electric heater on full blast, and went for a drink or 5 to drown our sorrows. We were sure we’d busted the van on our first night. We had to go without water the whole night and next day, as it was so cold that the pub’s water pipes had frozen! We went on a long walk on the Sunday up on to the moors and left the heater on, and crossed our fingers. The next morning, at 5am we awoke to a large sloshing noise and glugging and tapping. Hurrah, our pipes had thawed and our water came back to life, with no signs of any damage. PHEW! We could now relax and enjoy the rest of our holiday. If you haven’t been to the North York Moors, you really must go. It’s a fabulously bleak place, with many ancient crosses dotted here and there. A real gem of a place for walking and we just loved it. We were treated to some fabulous scenery as it was snowy and cold, but we loved it! My, oh my, it was bloomin lovely and well worth the journey there. The views were lovely, and it was so cosy! 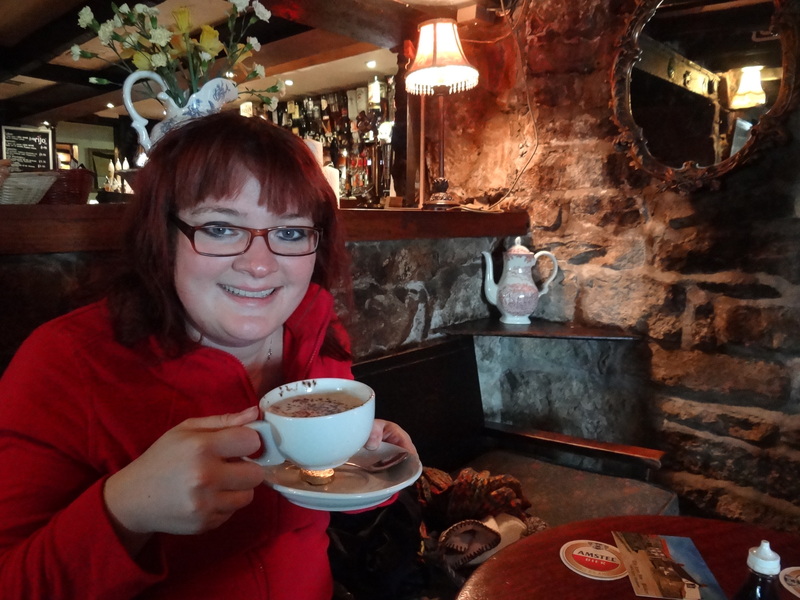 It had a lovely interesting interior and was packed with walkers. Just up our street. We enjoyed a gorgeous lunch there before heading to the Hole of Horcum. 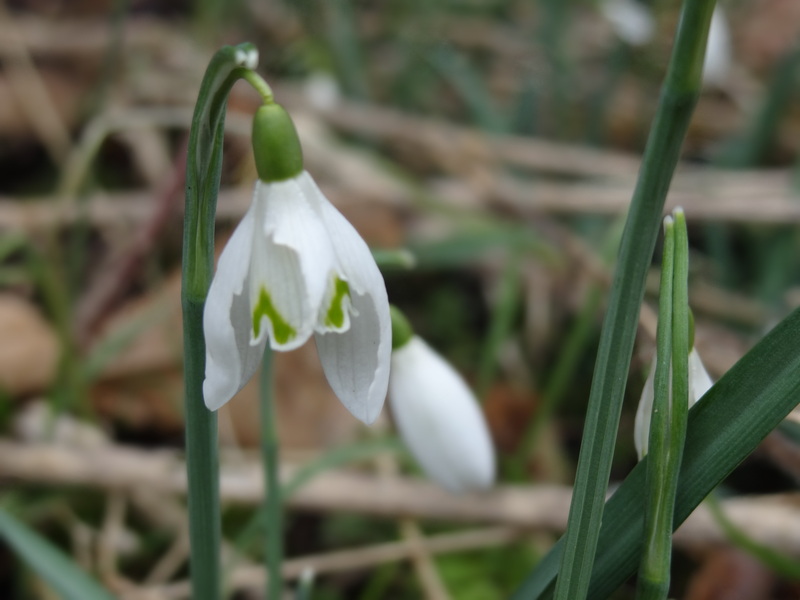 My favourite thing about this time of year is the snowdrops- my favourite flower. The pretty little villages dotted along the Moors were lined with beautiful displays of snowdrops, a real treat to see. After a couple of days exploring the Hole of Horcum by foot we headed to Robin Hoods Bay and found a gem of a site for a fiver a night WITH ELECTRIC!!! Needless to say, we booked onto there for 3 nights and set up pitch. It was FAB! We thoroughly enjoyed exploring Robin Hoods Bay, from this site, and the view from our brand new rear view lounge was just what we had anticipated when we were deliberating which layout to get.